Northern Italy is one of those parts of the world that has become extremely popular with tourists over the past few years. In particular, Lake Garda, which boasts a deep history dating back to the bronze age. Tourism really started to explode there in the 1950’s when the whole area became known as Riviera of Olives. Whenever anyone visits here, they are immediately overcome by the natural beauty and the masterfully designed architecture. Palazzo dei capitana which is a world famous Gothic palace, is situated here. It has a very busy square that has a wide selection of cafes, bars and other food treasures for you to try out. 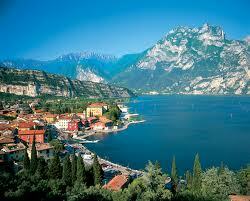 If you are into your windsurfing, climbing or mountain biking, then Lake Garda will be right up your street. If you prefer, you can just walk around the little villages that pepper the area or hop on a bicycle and whisk through the numerous vineyards that can be found. With a smashing selection of accommodation types to cur choose from, you’d be wise to do your research before you come – just to make sure that you get the best deal that suits your pocket. You can’t come to Italy and not know about it’s top of the range cuisine. Lake Garda also has some exceptional restaurants and cafes for food. All the restaurants use the best produce possible and only the finest ingredients are used in the dishes. Olives and lemons are eaten a lot throughout the region. In the northern end of the region, the world famous Trentino dry white wines can be found. Visitors can enjoy a refreshing glass or 3 while they bask in the delicious sun. You can also learn about the Italian culture here from some of the locals, who are great characters, some with pretty good English. A lot of families and couples come to Lake Garda, and it’s a very popular place for boyfriends to get down on one knee and propose to their other halfs! Travellers from all around the world come to Lake Garda to enjoy good food, good wine and a general good time. Take a break here and you will be rewarded with a unique cultural experience from the most passionate cultures in the world!